Preheat the oven to 375°F. Line a large (or two smaller) cookie sheet completely with foil. Cover the bottom of the sheet with baking parchment — on top of the foil. This is very important since the mixture becomes sticky during baking. Line the bottom of the cookie sheet evenly with the matzohs, cutting extra pieces, as required, to fit any spaces. In a 3-quart, heavy-bottomed saucepan, combine the butter or margarine and the brown sugar. Cook over medium heat, stirring constantly, until the mixture comes to a boil (about 2 to 4 minutes). Boil for 3 minutes, stirring constantly. Remove from the heat and pour over the matzoh, covering completely. Place the baking sheet in the oven and immediately reduce the heat to 350°. Bake for 15 minutes, checking every few minutes to make sure the mixture is not burning (if it seems to be browning too quickly, remove the pan from the oven, lower the heat to 325°, and replace the pan). Remove from the oven and sprinkle immediately with the chopped chocolate or chips. 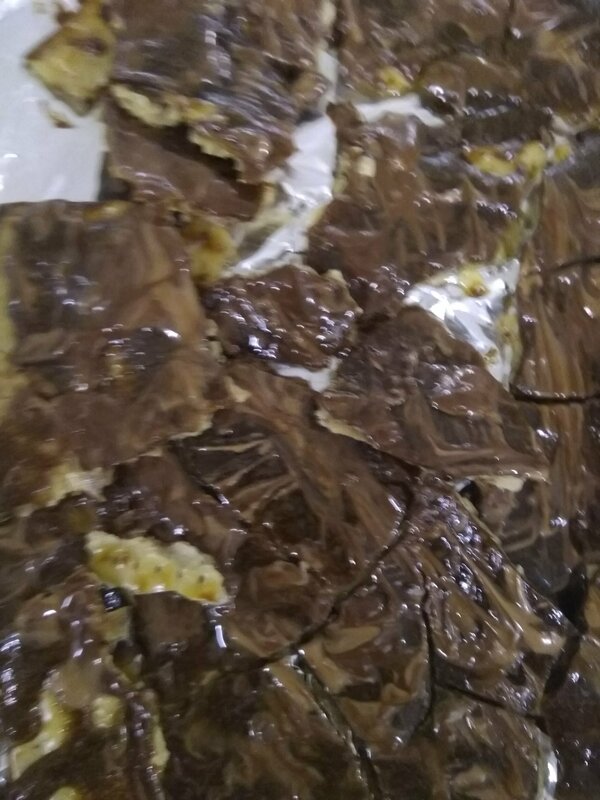 Let stand for 5 minutes, then spread the melted chocolate over the matzoh. While still warm, break into squares or odd shapes. Chill, still in the pan, in the freezer until set. This makes a good gift. You can also use coarsely chopped white chocolate (or a combination of white and dark), and chopped or slivered toasted almonds (sprinkled on top as the chocolate sets). You can also omit the chocolate for a caramel-alone buttercrunch. My notes: we didn’t have margarine. My husband made these with 2:1 ratio brown sugar:palm oil (based on the 3:1 ratio of syrup for yerushalmi kugel). The first batch burned. The second batch, we measured from the very first bubble, and took it off after 3 minutes 40 seconds. We’re not certain it cooked as much as it needed to. That said, I can’t taste it with the matzah yet, but I broke off a bit of the crunch and it was quite good. We did not have issues with stickiness. Mix the eggs, sugar and oil. Add the vanilla extract, potato starch, baking powder and ground nuts. 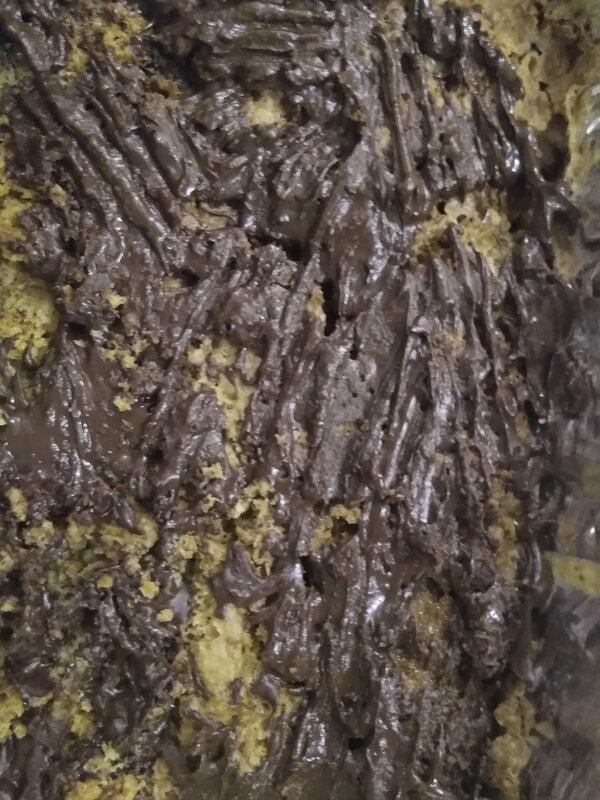 Pour this batter into a lined 9×13 inch baking pan. Sprinkle the top with chocolate chips. Push them down part way into the batter. Bake for 45 minutes until it is done in the center. I actually use for the sugar, ,1cup each of brown and white (so more sugar than they say) also it takes me closer to an hour to bake. Don’t do what they say for the choc chips. Don’t mix them in . just let all the Rest of ingredients bake. And when you take it outside of the oven, then sprinkle chips on cake and let them get hot for a minute and then spread. My notes: this was the first recipe I made after bedikas chametz, and I made a triple batch. I didn’t want to use up the brown sugar so I did 4 cups white, 2 cups brown. Otherwise no changes. Line two large cookie sheets or jelly-roll pans with parchment paper. Set aside. In the bowl of an electric stand mixer, mix oil, sugar, matzo meal, cocoa powder, eggs, vanilla, and baking powder until a soft dough forms. Roll the dough into 18 balls slightly larger than golf balls. Fill a small bowl with confectioner’s sugar and stir with a fork to break up any clumps. 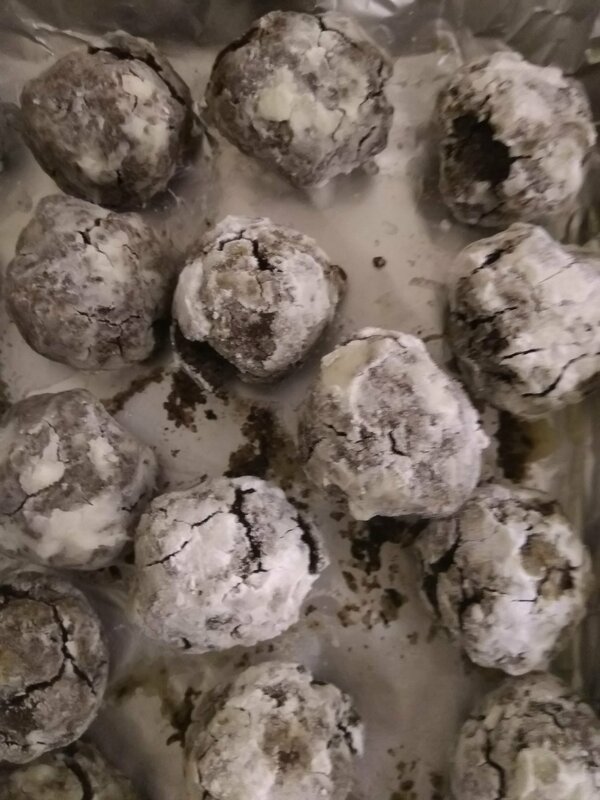 Lower balls, one at a time, into confectioners’ sugar and toss to coat heavily and completely. Transfer to prepared pans. Leave room between dough balls, as cookies spread during baking. Bake for 18 minutes. If you like, you can make smaller cookies; form walnut-sized balls and bake for 12 minutes. Cool completely. Yield: 18 large cookies. My notes: since I didn’t have enough white sugar, having used it up in the blondes, I used brown sugar mostly instead. I didn’t have a blender, I mixed by hand. I misread instructions and made slightly smaller than golf ball rather than slightly larger (but I overestimated the size of golf balls so possibly it came out roughly even I dunno). I was expecting the cookies to rise/spread more than they did – you can really pack closely together in baking pan rather than leaving lots of room. This is the first ever time I’ve basically successes with this recipe! Whoo!